Workers’ compensation and short-term disability are two different benefits that some companies offer their workers. They are designed to help the employee in the event of an illness or accident that renders them unable to work. In most states, short term disability is optional. Companies are not required to provide it. However, a few states, New York included, are mandated by law to provide the coverage to their employees to cover any illness or injury that is sustained while off the clock. All too often, people treat these two benefits as interchangeable when in fact, they are not. They come from two different areas and have two very different purposes. Workers’ compensation – Provides benefits to someone who was injured at work, while on the job. Short-term disability – Provides benefits to someone who has an injury or illness that is not related to work. While the two types of insurance appear to be very different, their application may sometimes overlap. In New York, for instance, if you were injured at work but your worker’s compensation claim was denied, your next step would be to file for short term disability. Sometimes, though, this can backfire. If New York State’s Workers’ Compensation Board denies your claim and says you should be filing for short term disability, but short-term disability says you should be filing for workers’ compensation, it could leave you in a very uncomfortable limbo. Usually you have to hire an attorney to get the situation sorted out. Understanding the difference between these two insurance types and knowing how you could be affected will help you regardless of which type you file for. While neither will cover your entire salary, the payments can be a help when you are unable to work. New York law requires employers to provide their employees with short term disability coverage, but it does not require them to pay for it. A company may offset the cost of providing these benefits by collecting contributions from its employees. However, the company can only take one-half of one percent of the employee’s wages, not to exceed $0.60 a week. The disability benefits are disbursed in the form of cash payments made weekly to the injured worker to pay part of the wages they lose by not being able to work. The payment is 50% of the person’s average weekly wage, but it cannot be more than $170 a week. It does not provide medical care or any benefits beyond this weekly cash payment. The maximum amount of time that a person can receive short term disability is 26 weeks after an initial seven day waiting period. This is during a consecutive 52-week period. This is a good plan for employees who have been injured in a non-work-related accident or are ill because it allows them to pay their living expenses even though they are not getting a paycheck. An employee who has been injured on the job may qualify for worker’s compensation. The payments for this benefit are larger than short term disability. In New York, the weekly cash benefit is calculated by averaging the employee’s salary from the year that immediately precedes the injury for a weekly amount. Two thirds of that amount is their weekly benefit but it cannot exceed the maximum payment that is defined by law, determined on the date of the injury. Medical care and prescription drugs are included in New York workers’ compensation, along with the weekly cash payments. Additionally, an employee can draw worker’s compensation for longer than they can short term disability. 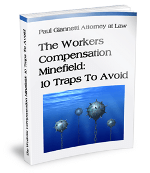 They also may negotiate a workers’ compensation settlement and receive a lump sum, depending on the details of the injury. If the employee settles on a “Section 32 Agreement” then all medical benefits stop. If they need surgery later or if their condition worsens, they are solely responsible for it. It is no longer covered by worker’s compensation. In some cases. such as in the event the insurance carrier or employer claim that the injury is not related to work, the employee may dray short term disability until the issue is settled. Also, if the employee can return to work but their wages are impacted, meaning they can’t earn what they were earning prior to the injury, they may be eligible to receive a benefit that pays two-thirds of the difference of the wages lost. 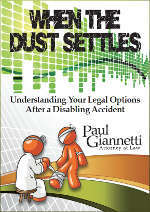 If you live in New York and you’ve been in an accident at work or have a worker’s compensation claim but feel you may need a worker’s compensation attorney, call the law office of Paul Giannetti today. Get the worker’s compensation settlement that you deserve. Most insurance companies don’t operate in your best interest; they want to settle for the lowest amount possible. Don’t accept that settlement offer until you’ve talked to us. Contact us today using our online form.